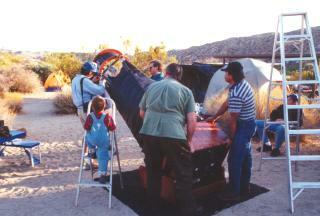 The 22-inch Dobsonian Telescope (named "Capella") was generously donated to the RAS in September of 2000 by the Western Observatorium (WO), an astronomy club that had recently disbanded. 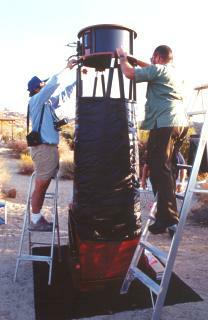 Through the WO's outreach efforts, this telescope was hauled around southern California, showing the public the wonders of the universe. In an effort to maintain this philosophy for the Capella telescope, WO's donation was made to the RAS because of our similar ideas of what it means to share our hobby with others around us. What's All This Hayward C3 Stuff? Paul Livio, as a member of WO, was heading up the team to put the Capella project together. Here is his story about our newly acquired telescope. A recent article by Bill Seavey in the Prime Focus jogged my memory. 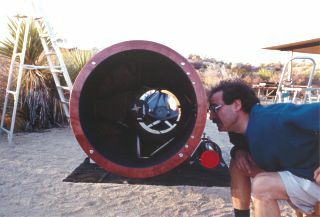 Since its founding in 1976, one of the goals of the amateurs and educators that comprised Western Observatorium (WO) was to build a large, permanent observatory in a dark sky location. To that goal a committee was formed, and with all committees came disagreement. Originally a 20 to 24 inch Cassegrain or Dall-Kirkham telescope was envisioned. A member, whose name escapes me, volunteered to begin rough grinding using the facilities of the optics lab at Citrus College in Azusa. A month or so later the original Pyrex blank returned (in several large pieces). Supposedly too much weight (and pressure) was applied to the grinding machine and hence we now owned some expensive garden rocks. All was not lost however. Kevin Ritchel (WO member and marketing guru of Celestron) told us of four 22" blanks that were available for a reasonable price ($750). One blank went to the Orange County Astronomers, one to WO, and the rest to some guy in Canada. Remember, Celestron once advertised a 22" Schmidt Cassegrain! An amazing instrument! The blank (now part of Capella) is made of Hayward C3 - strange stuff with a coefficient of expansion about 2 times that of Pyrex. The interior also contained strange metal globules (?) but grinding would never bring them to the surface. On September 29, 1985, funds were authorized by the Board of Directors to get a quote on a 22" dual f/5 Newtonian / f/20 Cassegrain. Through my contacts I located Jerry Brunache, an excellent optician who has done work for most of the aerospace companies in So Cal and is an expert in generating aspherics. Anyway, after talking to Jerry and lowering our expectations Jerry convinced us to stick with a Newtonian of f/5 (easier to figure) and he agreed to start grinding and figuring the mirror for $1,200. This was a real bargain. So later that month Roger Wilcox and I traveled to Carlsbad to visit Jerry's shop and drop off the blank. One year later the 22" was done. The 22" languished at Roger's house for two years while the telescope committee argued over how to mount and where to get the money to build an observatory class instrument. A visit to Ed Byer's shop told us that a driven equatorial mount would cost upwards of $75,000! Through a friend at Hughes Aircraft I heard of a new Dobsonian telescope maker - Starsplitter, run by Jim Brunkella, also from Hughes. While at a star party at Mt. Palomar campground, I watched (and purposely didn't offer to help) as Jim unloaded a 17" Dob from the back of his Toyota Land Cruiser. He had it set up and was observing in less than 10 minutes! As "project manager" I made the decision to go with Starsplitter. Dennis Matlack and I drew up statement of work (contract) with Jim. Capella (the 22") was born. A call to GM coating lab in Costa Mesa got us a (donation) of $150 for aluminizing—cheap! After some anxious moments when we discovered a stain in the center of the mirror, GM went ahead with the coating. Setting up Capella at the Cottonwood Springs Campground in Joshua Tree. 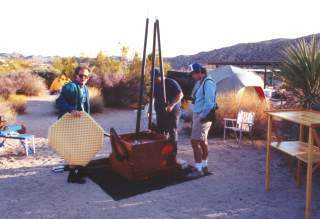 First light was at Cottonwood Spring campground in Joshua Tree in November of 1993. Of course the first object looked at was Capella! Disaster almost struck when the mirror (105 lbs.) fell out of the sling type mount. Quick action by Bill Lennartz and others saved the mirror. Lesson Learned: NEVER use a sling type mirror mount with large (and heavy) mirrors. Also, optical alignment seemed to change with scope altitude, another side effect of sling cell (see Figure 2). Early the next morning (5 AM) a flash flood hit the campground and a mad dash ensued to cover and put away the scope. With the excellent machine shop skills of Bob Hebard and some design work by Dennis Matlack, a real 18-point floating cell with positive mirror clamps was built and tested. This involved modifying the stock and actually lightened the structure. Gone were the alignment problems. Since I had only had a quick look at the Foucault test when the mirror was delivered, I decided that a more thorough evaluation of the mirror figure was in order. I prepared two 22" masks (odd and even zones) according to equations learned in El Camino College's Astronomy 13 course (highly recommended). Perry Hacking, astronomer and professor at El Camino College graciously allowed us the use of his mirror lab and helped to evaluate the Foucault test readings with his lap top. At first the 22" appeared to be more than a full wave under-corrected. (A disaster... Remember the mirror had sat in the pack of a hot SUV.) But after a burrito lunch and 2-hour cool down in the air-conditioned Math building, test data started to look better and better. Finally, it was calculated that the mirror was about 1/10 wave accurate. Not bad. Lesson Learned #2: Run the fan and allow plenty of cool-down time before observing (and final alignment). 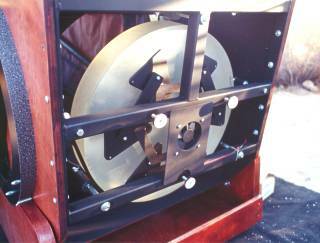 Weighing in at well over 200 pounds, transporting and moving the rocker box with mirror is not an easy operation. Jim Brunkella came to the rescue with long wheelbarrow handles with large pneumatic tires. It can be handled by one person, but the 22" is definitely a team effort. Paul Livio, Mike Vradenburg and Robin Benjamins assembling Capella. Perhaps not suited to planetary observation (always seeing limited), this scope excels in views of diffuse nebula and supernovae remnants. M42, M8, the Lagoon, and the Veil Nebula are spectacular. The view of the Horsehead (with hydrogen-B filter, of course) rivals photos taken with large instruments. Also, Czernic Crute and several others have added their names to the short list of advanced amateurs who have seen Simesis 147, a faint, extended SNR in Taurus, as well as the Vela SNR. Finally, several thousand campers have viewed the wonders of the deep sky at public star parties held over the last 12 years at Mt. Palomar State Park, Chilao campground, Cuyamaca State Recreation area, and Joshua Tree National Park. Now through the efforts of the RAS , many more will be able to enjoy and marvel at the night sky. Thanks to all my friends, especially Dennis and Margaret Matlack, who helped with the 22". If I have omitted any names, my apologies. Senior moments are becoming more frequent now! Thanks again to Bill Lennartz for the photos, and to all best wishes and clear skies! In late 2014 and early 2015, thanks to the approved funding by the RAS Board, Capella received some much-needed repair and updating. The "Capella New Millenium Project" was largely planned and executed by Carey Sublette, the RAS Capella Operations Director. Among the many modifications and improvements, Capella received new coatings on its mirrors, digital setting circles, a simplified and improved mirror support system making collimation easier and more reliable, a new custom carbon fiber/balsa secondary holder, cooling fans with internal rechargeable battery, bracing reinforcements of the mirror box, altitude brakes, a carbon fiber boom supporting the Telrad, and a piggyback/finder scope, in addition to many minor repairs and improvements. Carey also contributed a top-of-the-line FeatherTouch focuser and a new 80mm finder scope. The "Dob House" in which Capella sits when not in use also received some much-needed improvements. Rather than having the housing move back and forth to reveal Capella, the house was permanently positioned so that it could be made more dust-resistant. The Dob House was resheathed, insulated and carefully sealed. A filtered vent was added to allow the house to breathe while minimizing dust intrusion. The refurbished scope and housing were rededicated on February 14, 2015 during the star party. With the passing of club member Stan Broberg, his Stellarvue SV 80ED Raptor refractor was donated to the club and became the new piggyback/finder scope.